Scones have always been a love of mine. So when I taste a dry, flavorless scone, it truly makes me sad. A good scone is a bit dry on the outside, but soft, fluffy and moist on the inside. Almost like a biscuit, but sturdier. So it drives me crazy when people tell me they don't like scones, because I'm just gonna say it...you just haven't had a good one. If you've had a good scone... it makes all the difference in the world! This is a good scone. I've used this recipe dozens of times and it comes out delicious everytime, But this is kicked up for the fall. It's as simple to make as a biscuit but I find it less fussy. You can use regular all purpose flour and the dough is kneaded a bit. Yep, you can touch it, roll it, it's not going to be a disaster. You start by mixing the dry ingredients together. Then cut in the butter till it looks like small pebbles. See... just like a pie dough or biscuit. Then I mixed together the buttermilk (this also works with regular milk or cream, but I love the tang of buttermilk) with eggs and the pumpkin puree. It turns this gorgeous pale orange color. Pour this into the the flour and mix till it starts to come together. It's going to look a bit dry, but if it seems too dry and that it 's not going to come together, add about a tbsp more buttermilk. Turn this dough out onto a well floured surface. and knead. Yup... knead it about 25- 30 times until the dough is smooth and without cracks. Then roll the dough to about a 1 inch thickness and cut out rounds. Place the rounds on a parchment lined baking sheet and bake for 12-15 minutes. Start with 12 minutes and heck for doneness. 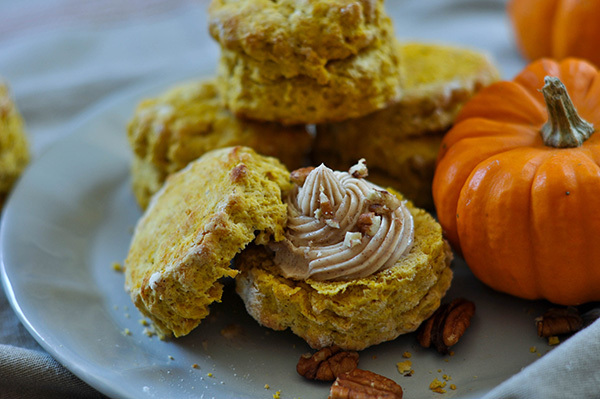 Allow the scones to cool while you make the maple butter. Beat the softened butter in a stand mixer. Once fluffy, add maple syrup and cinnamon. Once scones are cooled, top with maple butter and a sprinkling of pecans if desired! Preheat the oven to 500F. Line a baking sheet with parchment paper. Set aside. Add the butter and using a pastry cutter, cut the butter into the flour until it looks like small pebbles. In a large measuring cup whisk together buttermilk, pumpkin puree and eggs. Add the pumpkin mixture to the flour. Stir with a rubber spatula until it starts to come together. Add a bit more (but not too much!!) buttermilk if it still feels crumby. Turn the dough out onto a well floured surface and knead 25-30 times to get the dough smooth. Roll the dough out to about a 1 inch thickness. Don't go too thin or else the scones will come out too thin! Cut using a 2 inch round cookie cutter and place on a parchment lined baking sheet. Brush the tops with milk. Lower the oven temperature to 425F and bake for 12-15 minutes. Make the maple butter: Beat softened butter in an stand mixer fitted with a paddle attachment. Once fluffy, add 2 tbsp maple syrup and 1/2 tsp cinnamon.. Beat until combined. Allow to cool and top with maple butter!